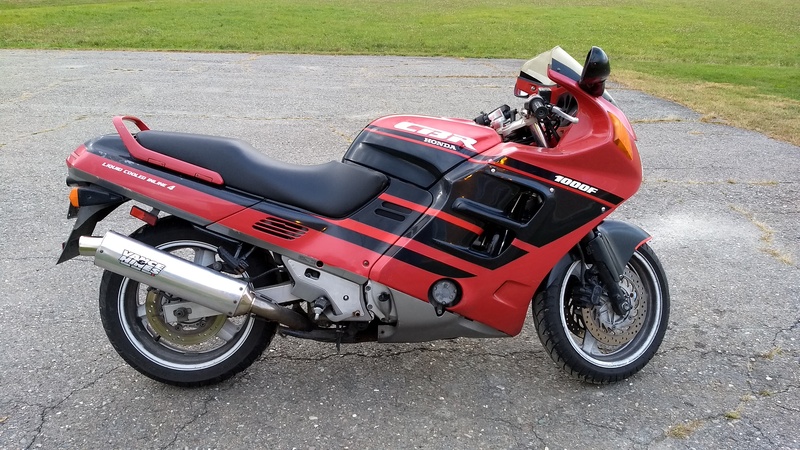 Hey everyone, I just bought my first "fast & tuned" bike and it happens to be a CBR1000f - I think I'm in the right place For the most part I built/bought/rode/sold HD V-Twins over the past 25 years. The Hondas and Suzukis always stayed in the garage more for some reason - Maybe because the ones I had were all lackluster small displacement cruisers and nothing spicy. 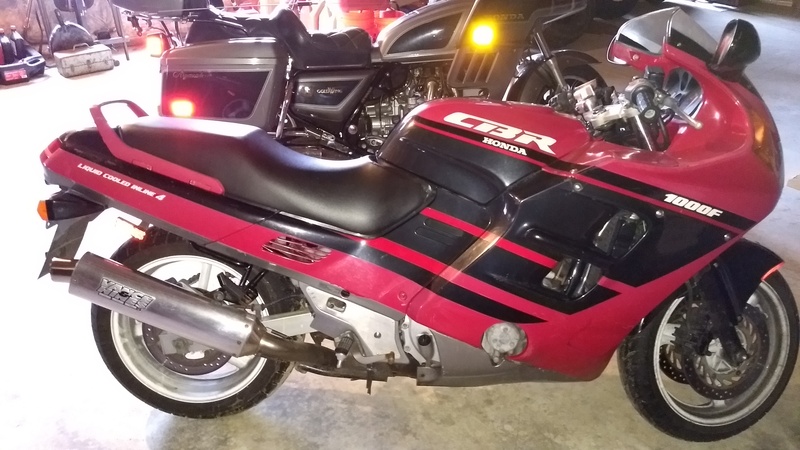 So I picked up a sweet older Goldwing Aspencade to couch-ride to FL this winter and got the Honda bug - The Wing is a marvelous motorcyle, I love it. Whirrs, purrs and handles great. It will take me the 2050 mile trip in style - I can endure about 1000 miles on an FXR only to stop between fillups - Definitely shouldn't feel as beat riding the Wing. And don't get me started on the radio lol! 1991 CBR1000f - Lovingly called a "Hurricane" - Yes, I got me one!! 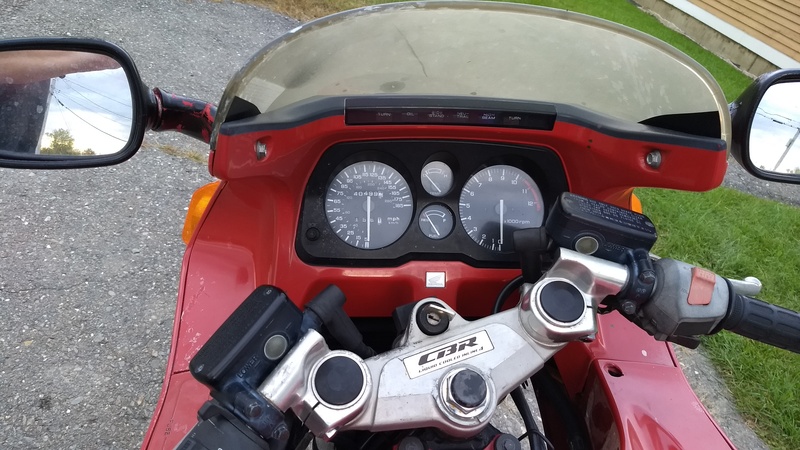 $1,000US - Hence the impulse part, normally would have tried for 700 being right before winter but I had to have it and it was a long ride home. 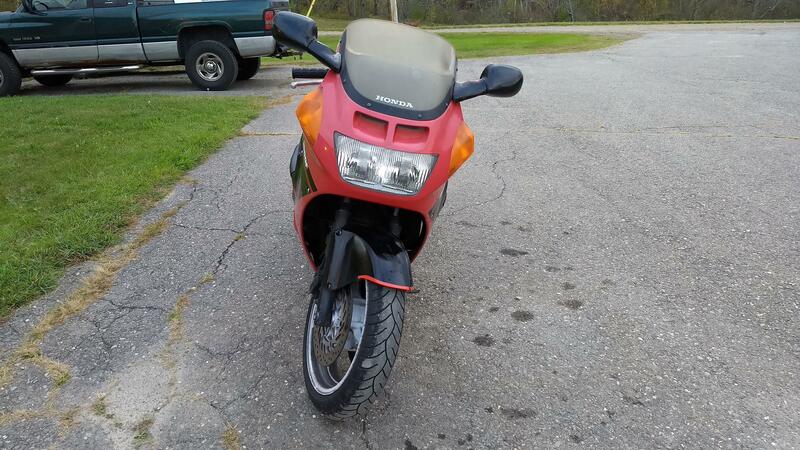 40,500 Miles - No history or helpful knowledge regarding the previous owners. It does not look loved, so clearly it was not loved. All safety features and lights functional, and has what we call in Maine a "State Inspection Sticker"
New chain, sprockets, caliper pads & tires. The rotors look good - Plenty of meat on them and no grooves. 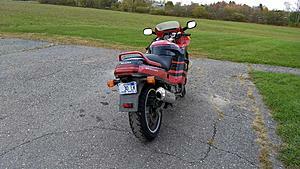 No obvious hand play in axles, swingarms or steering yoke - Just checked enough so I would dare ride it. Much more to look at. Wheels are brake dust dirty and should clean up. Charger is chargin', sparkers are sparkin', runs on all four, clutch is clutchin', all that stuff seems good. A laborious first thread, sorry, but now down to the engine, which concerns me. I mentioned bulletproof but I don't know, man. 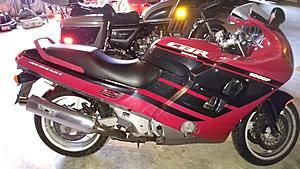 40K is a turning point for a lot of things for a CBR I guess. My inspirational research was good, technical research was not. The noises are normal from what I'm gathering and it does quiet down a lot after a few minute warmup, but to the extent of continued use I'm not sure. So far after a tank spiked with Sea Foam, at 5K RPM and below it's somewhat of a turd that doesn't idle right without the choke cracked a little. After 5K its "OMFG I love it!!" Scared me enough to buy my first helmet in 20 Years. And I haven't even breached 8K RPM yet. 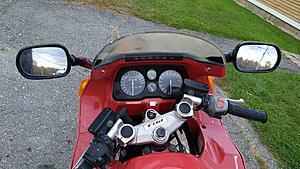 So I have to clean the carbs to get the obvious idle circuit unclogged and smooth again. Then put them back on. Then sync them. The CCT at least needs to be replaced/cleaned, most likely chain too. I did research and watched You Tube videos about why a manual tensioner is not a good idea. There is a rattle at exactly 5K RPM, not sure if something on the frame is loose, or unadjusted valves yet, or cam chain. 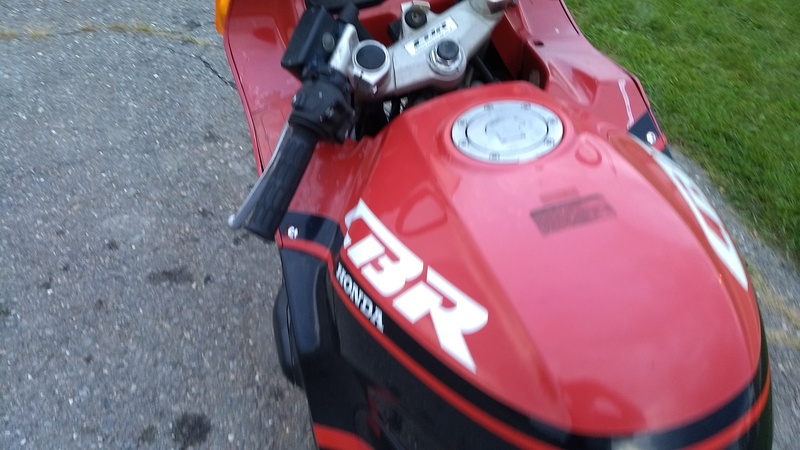 Don't have the panels off so I can't tell if some of the rattle is lower end, indicating chain noise from other components I guess? Normally at this point with something familiar to me I would take the engine out and just "do it" which would involve checking tolerances and if everything was reasonable replace rings, bearings, pumps and clutches. Or find another motor. Did I mention you can't find any parts for this thing? Is it worth just cleaning/setting up the carbs and doing the tensioner/chain, and is there anything else I should know about? Also, if there is alternator and oil pump chain noise, what happens if I just let that ride? That is great info, thanks! It will most likely be my course of action to just clean the carbs and adjust the valves for sure before I get froggy with that engine. Very key for you to mention checks for oil starvation, mic the cams, fuel pump check and especially the compression test. I'm definitely cleaning or replacing the CCT, read that cleaning it is perfectly fine if not replacing the chain but it's only $130 and a chain is $50 so on the fence about that. If tolerances check out, maybe just buy those while it's apart? And good point to to retorque the critical chassis bolts. I already got my repair manual, Honda common service manual and owners manual downloaded and ready to go (The owners manual, often overlooked, already helped me get my seat removed lol!). Thanks again tentacleslap, I'm already feeling better! Hi Gronk, welcome to the forum. They are great reliable bikes, the only weaknesses were the R/R, the cam chain/tensioner and if the headers are original they can rot through. Thanks Hawkwind, I see why there is an aftermarket exhaust on it now - Mine has a tomato can looking thing similar to what the kids put on their junky little cars. I probably get .0025 more horsepower but it's ugly. One more ride today before the panels come off. 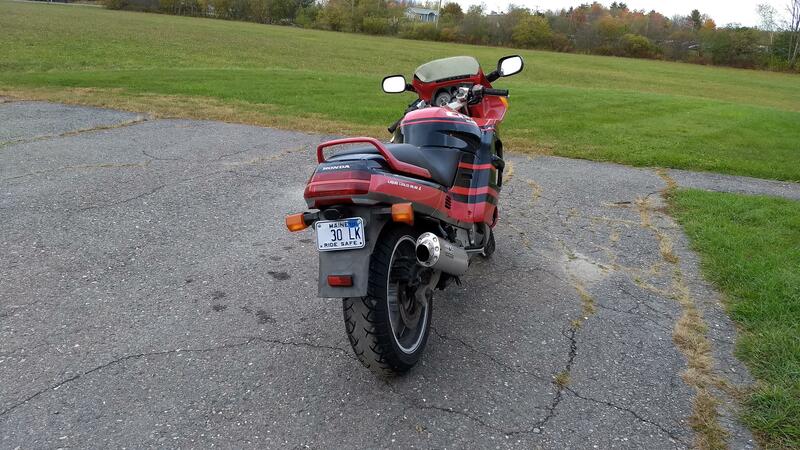 It is running better and sounds quieter after the 182 miles I've put on it. The previous owner definitely let it sit too long. Sea Foam in every tankful, and I put some in the oil too. 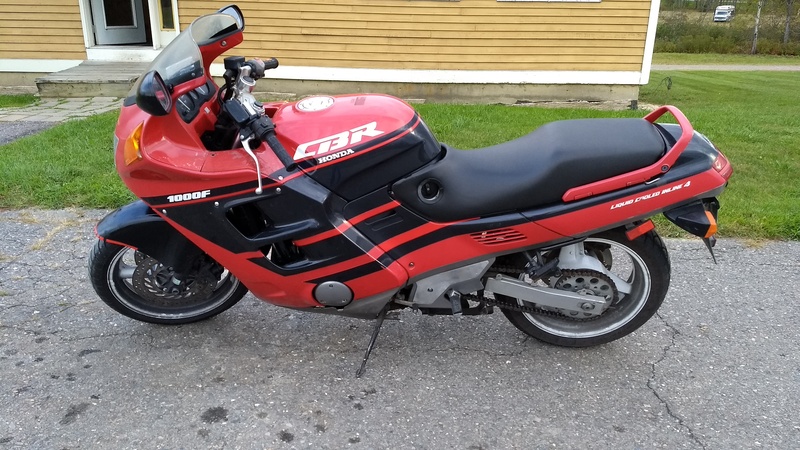 The only thing I've noticed so far is a couple drips of antifreeze out of what I think is the reservoir tank coming from the right side of the bike. The oil is clean and exhaust is clear so probably just a leaky hose or something. I really want to crank this thing up but it's not ready for it yet, so far just easy riding with occasional acceleration spurts. cheapcycleparts.com and bikebandit.com are still viable places for OEM parts, plus the all valuable fiches. Gunk, you are right, I'm going to post some pics of the old 'Cane even though she's rough! And thanks wofferdog, I'll check those bearings after one more tank of fuel. 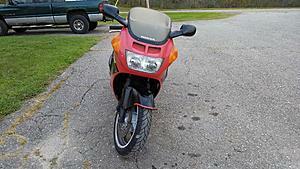 Put another 100 miles on her today Regarding parts I'm glad to have a couple more sites to look at. Some pics of the dirty bird! That's my mint wing in the background on the first pic. Last edited by GronkFries; 10-14-2017 at 08:08 PM.